Sorry for the lack of posts lately. 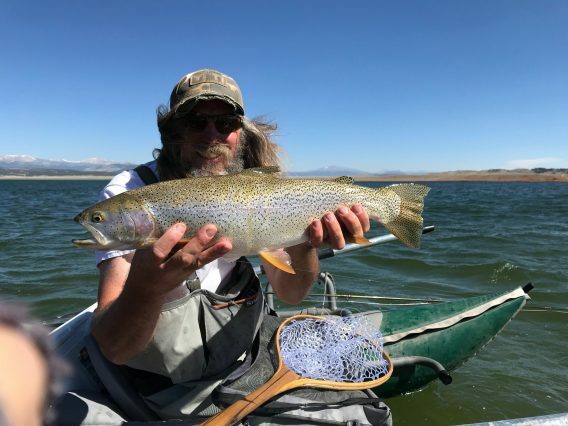 I had the busiest April for materials I’ve ever had and with the wind this Spring I haven’t had much time on the water. 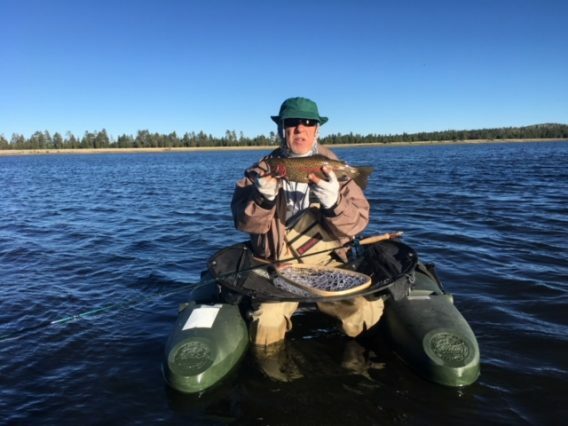 I hit a few of the high lakes with mixed success. Carnero is off the charts for nice rainbows and the occasional Tiger. Black simi’s have been the ticket for me but others are catching them on different patterns as well…stripping and under an indicator. The lake is wide open and the weeds that normally determine where you can fish are non existent so far. Big was slower for me. 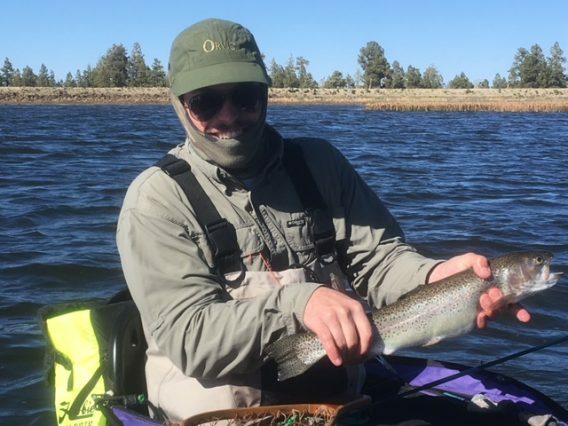 The fish were still out deeper than I was fishing, but that was three weeks ago. Becker has been fishing well…using the normal techniques. 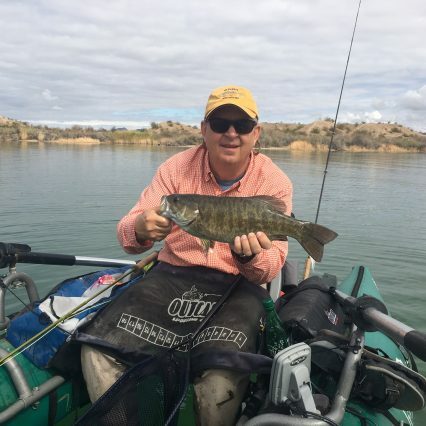 I have been spending some time on Show Low Lake, trying to figure out the smallies there…with moderate success. Materials are slowing down so I’ll try and do a better job posting. 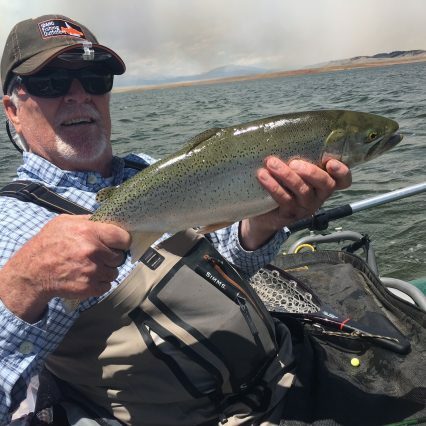 Daryl came up for a day of fishing at Carnero. Lake is lowww and is stained. It is a totally different lake from previous years. Last Fall all the weeds died in the center of the lake. The Spring winds have stirred up the mud and spread it throughout the water column, leaving about a foot of viz. You can fish the entire lake now instead of just the open areas. The fish have much more water to move around in so you have to go find them. Before you had no choice, you had to fish the open water and channels. Don’t get me wrong fishing… was great. We landed at least 45 between us. 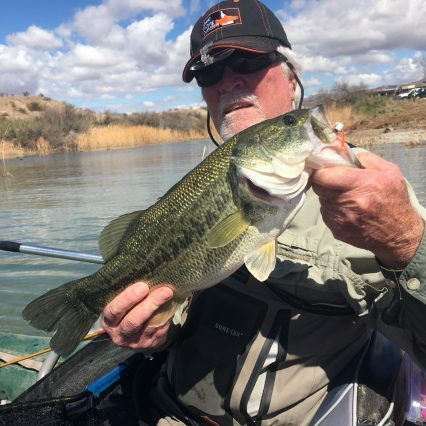 Most were caught on small black simi’s stripped close to the bottom….which in most areas wasn’t more than 3-4 ft. DW caught a few under an indicator but they definitely preferred the fly stripped. Fish are very healthy and fought hard. Biggest couple went 18″s, a couple 17″s and a quite a few 15″-16″ fish. I don’t think AZG&F had stocked yet. These all looked like fat, colored up, holdover fish and really fought hard. We didn’t land one Tiger which was a little disappointing. Not sure what’s going on because we fished pretty much the whole lake. Sorry, no pic’s. I forgot my phone. Here’s a couple from DW. I hit Rosey again Friday morning about 10 and fished until 4 that afternoon. Launched at Windy Hill this time seeing if I could find some clearer water that had been sheltered from the winds some. Water was about the same but the algae wasn’t as bad so I had some better viz. Problem is the place had been hammered and the bed fishing was tougher. Managed to land a half dozen in about the first four hours….all 2 lb bucks. Fish were spooky and hard to get to play. I’m sure they had been harassed plenty. Wind came up so I started stripping, which turned out to be much more productive. 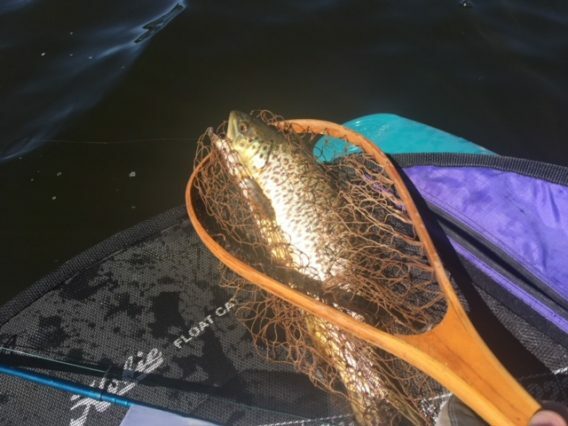 Using gold and shad colored Helmet Heads I landed 5 in the last two hours…biggest went almost 3. I stayed entirely in the Windy Hill area…fun day. Still looking for that big one. I hit Rosey yesterday afternoon for a little bed fishing. Wanted to see what the water quality was more than anything. I fished from 11-5, strictly looking for beds. Launched at Cholla and fished the shoreline all the way around to the back of Rock Creek. I did see a few bigger fish that just wouldn’t play. Going back for sure. The bed season only lasts so long and I try and take advantage of it when I can. I am addicted!! 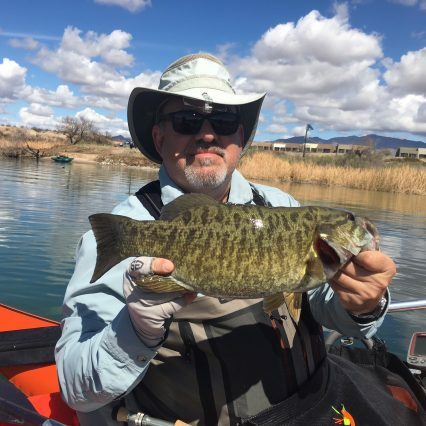 Joe, DW, Tim and I hit Havasu this past weekend….smallie time. 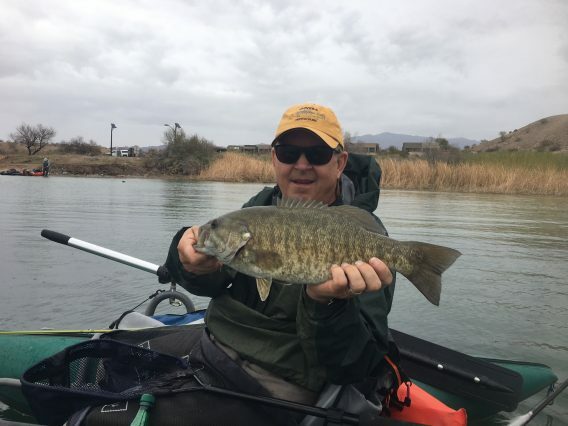 I had gone two weeks prior and the smallies had made beds but the recent cold weather had pushed them back off out into the deeper water. 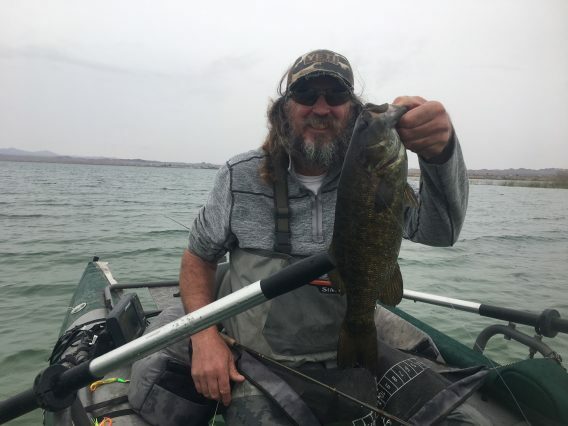 I fished one full day looking at empty beds under cloudy, rainy, windy conditions. Not exactly what you’d call a productive day of bed fishing. We had been checking the weather and the past week had warmed up considerably so we decided to give it a try again. Naturally getting close to the weekend the forecast changed to rain and clouds for Sat and Sun. Saturday dawned just that way and stayed that way all day, cloudy and spitting rain occasionally. We still managed to have a decent day but knew we were missing a lot of the deeper beds. 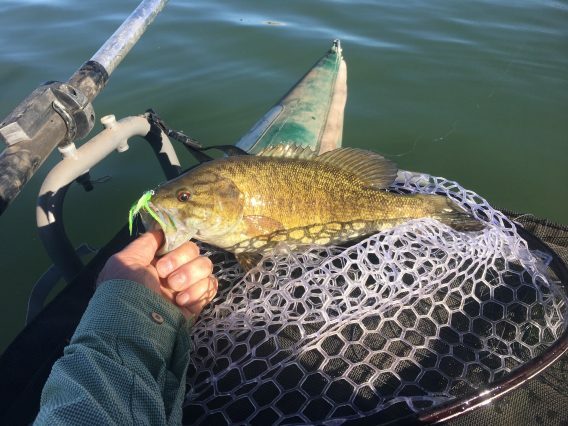 The smallies must have been just waiting for the water to warm because there were at least three times the amount of beds in the area from the previous visit. We even found paired up lmb’s, quite a few pair. We managed to get a couple to play after a considerable amount of harrassment. 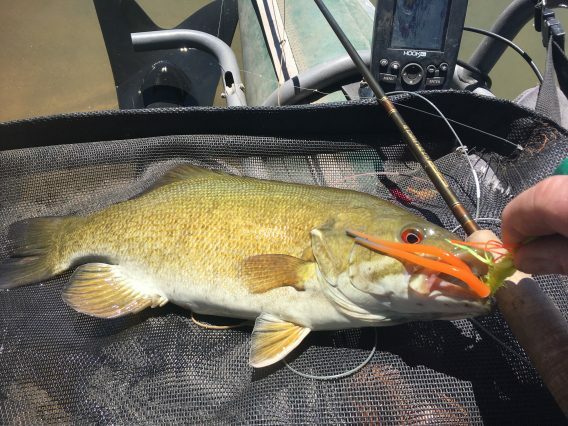 They sure don’t have the aggressiveness of the smallies. 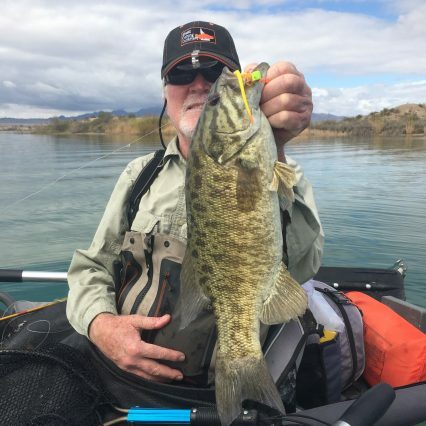 Those smallies just annihilate your fly once you get them hot. They’re awesome!!! 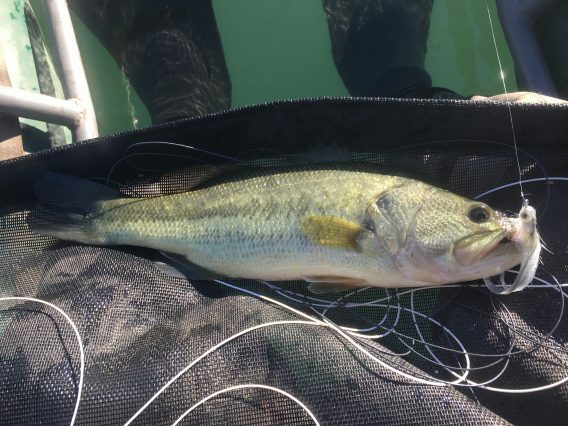 I’m not sure how many we landed but it had to be around 20 to 25 bass. It rained that night and was cloudy early the next day but forecast showed it clearing and minimal wind. Now this is more of what we needed for bed fishing! We knew there were beds we missed the day before and with the sun and milder winds we had a pretty incredible day. 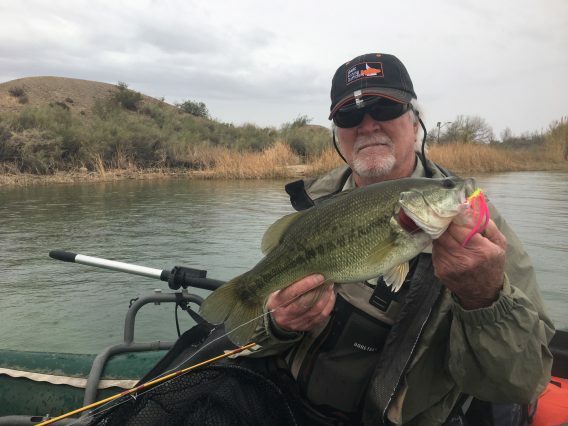 We all caught a lot more fish and even found more paired up lmb’s. We couldn’t get all of them to play (especially the biggest ones) but got a few to cooperate. We all caught over twice as many fish the second day and lost a bunch that jumped and spit the hook. When the sun came out the second day the algae started to bloom later in the day and made it much harder to spot the fish. I believe this may become a problem once the weather finally stays warm. 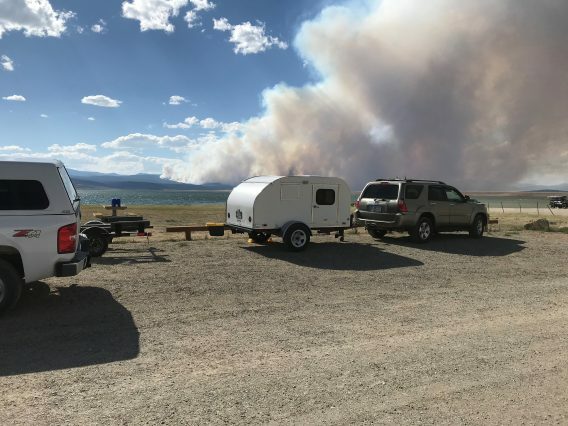 The lake is definitely different than it was in the past. I have been hitting it every Spring now for the past 12 years and it is not nearly as clear as it used to be. Not sure what the problem is but if you plan to hit it…I would go soon. Not sure how it’s going to fish after it starts staying warm. Hit Pleasant yesterday with Daryl and Tim. 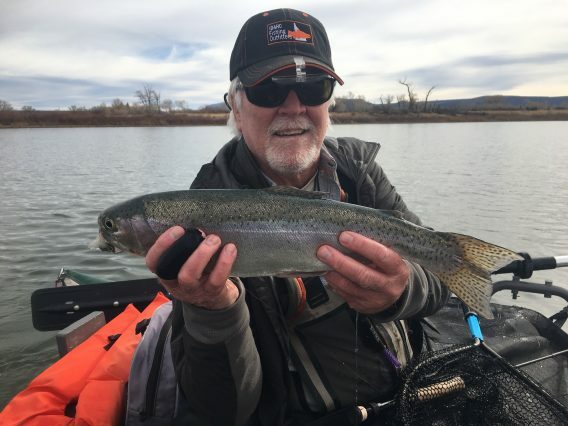 Beautiful day on the water….65, mild wind …and mid January. Gotta love AZ. 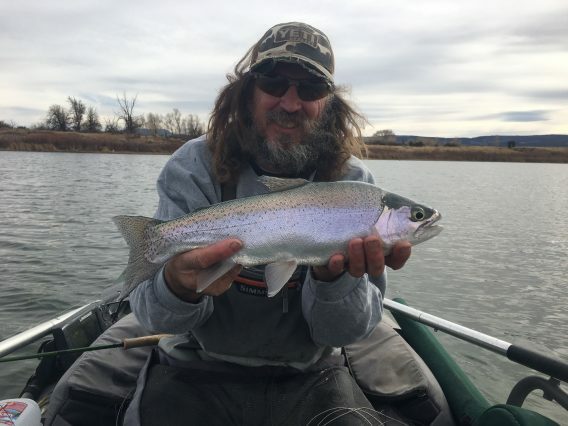 We fished form 9 to 5 and caught at least 20-25 a piece. Fishing Helmet Heads of various colors and sizes using 250 to 400 grain sinktips. Didn’t really seem to matter if you got into a pod that was eating. Most were down deep from 16′-24′ so a deep sinking line was a must. 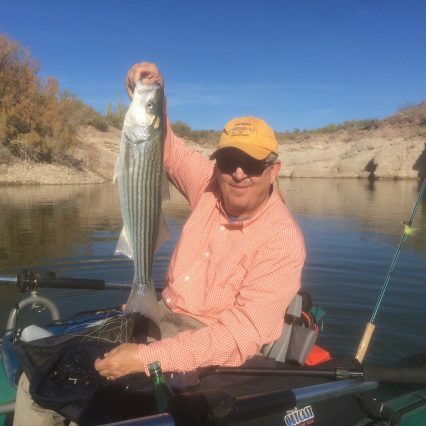 We landed stripers, lmb’s and white bass….mostly small. 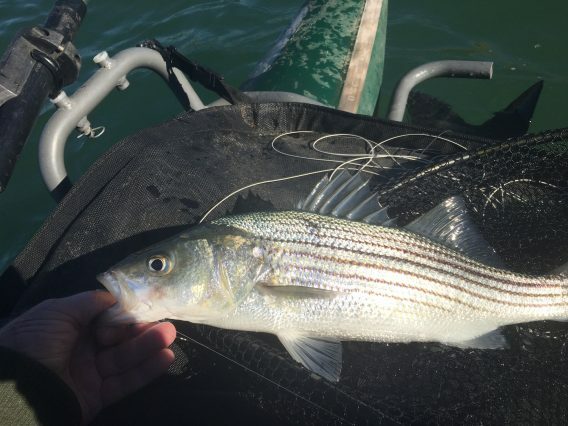 The average striper is of the pound variety but still fun and good fighters for their size. 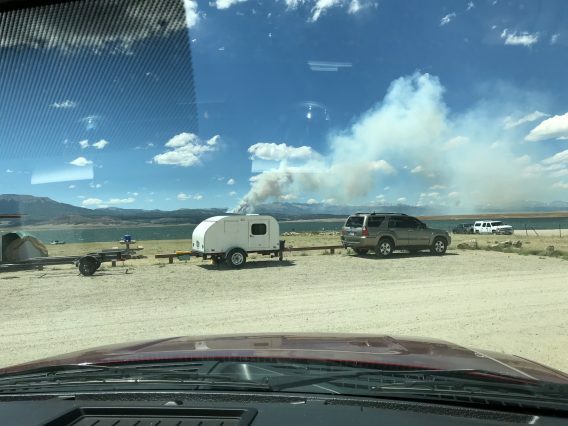 We were in Castle Creek and had quite a bit of activity for a Winter day….maybe it was the 65 degree temp’s and holiday weekend….ya think? 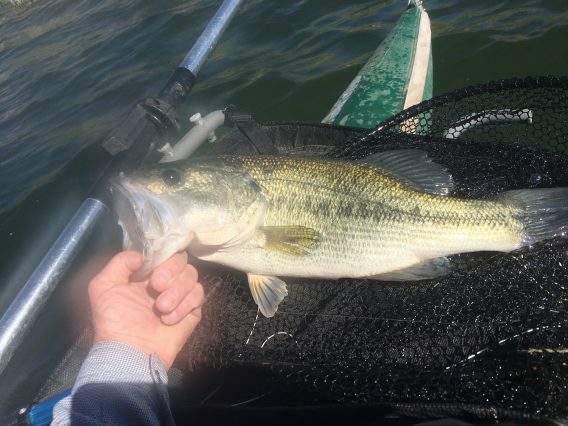 If the weather continues like it’s been…it’s gonna be an early spawn this year. See ya on the water. 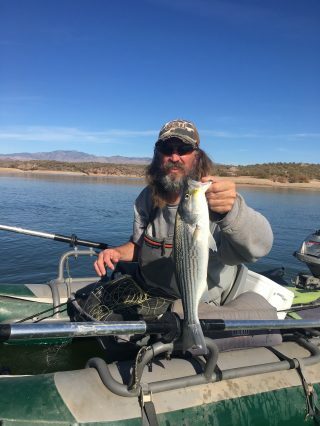 Daryl got tired of whacking the stripers at Pleasant so he decided to come up and spend some time up in the White’s. 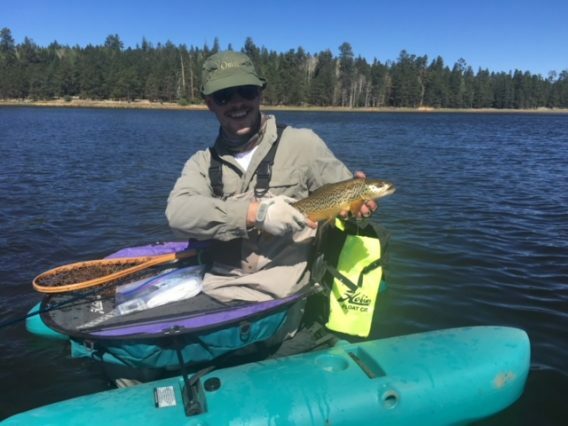 With this warm weather we have had over the past couple weeks most of the lower elevation lakes are still wide open. We hit Becker Sunday from about 11 to 3 and landed 6-7 between us. Everything was caught on Helmet Heads stripped pretty quick. Water temp’s were in the 39 degree range and you could definitely feel it in your toes after awhile. I decided to hit Havasu this past week. 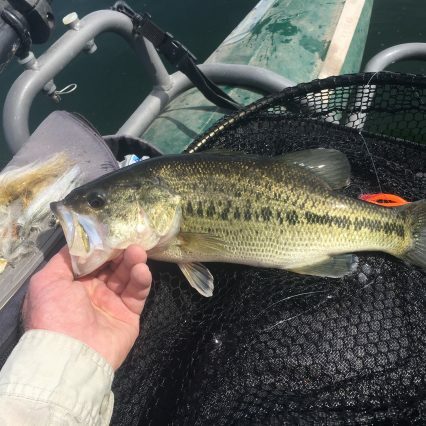 The bass/striper bug has been pulling on me for awhile now. 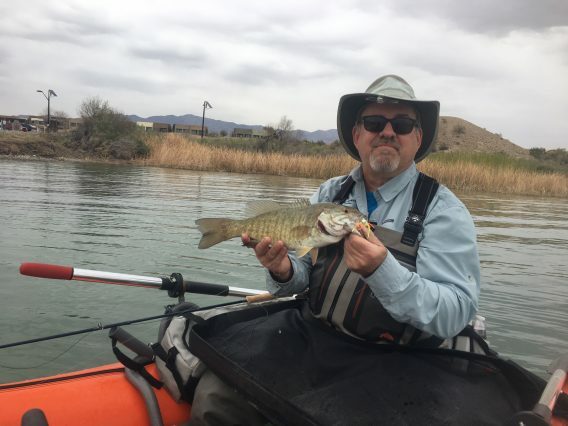 I was waiting for delivery of a rod repair on Tuesday and UPS is always late at my place so I planned to hit the road early Wed am and be at Havasu at first light. Rod showed up a day early so I hit the road Tuesday morning with the snow just starting to fall at my place. By the time I hit Snowflake it was pretty black in my rear view mirror. Didn’t mind that at all. They were calling for some wind at the lake but I went any way because it’s about a 50/50 chance they’ll be right. This time they were. The only water I could fish was at Site Six because it is shielded from North winds. 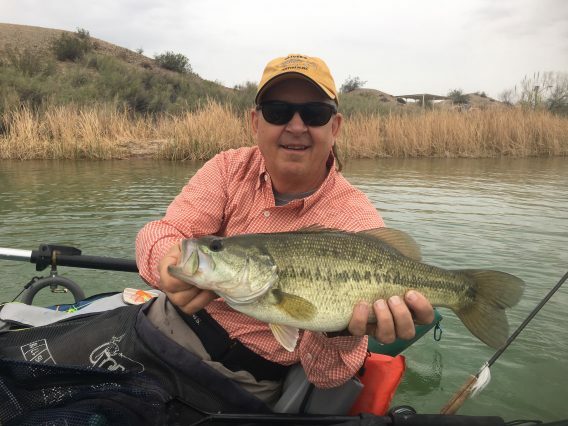 The past couple years it hasn’t been that good because most of the shad have been down south at the Bill Williams. I went south just to check and it was unfishable…rollers coming in that you could surf. 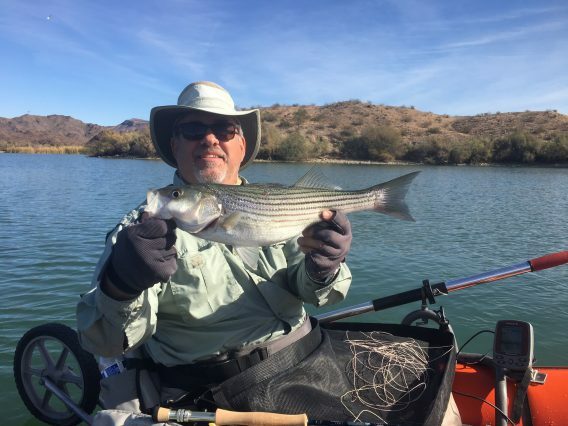 The water at Site Six was beautiful as usual and I caught about a dozen smaller stripers (1-1.5 lbs) with a couple 2.5 lbr’s in the mix and a decent lmb of about 3.5 lbs. Surprising because there were no shad to be found there. No idea what the fish were doing in there except maybe looking for a fly to eat…voila! Next day was calm in the morning so I hit the south end and found more shad and birds than I have ever seen there. It looked like the ocean. 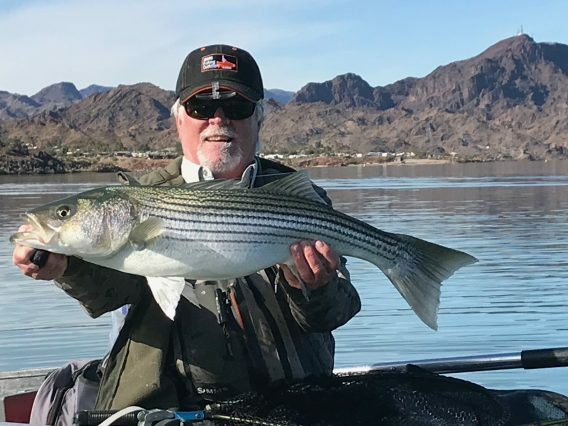 I have been hitting Havasu for 12 years now and a good day for me is 4-5 fish, usually lmb’s with the odd striper. 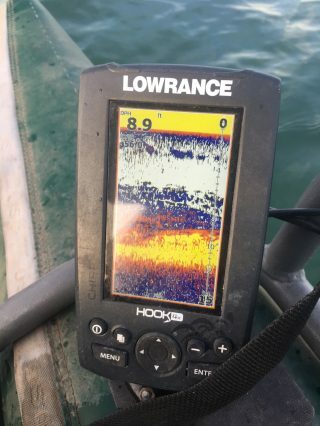 My fish finder lit up with huge balls of shad and lotttts of big fish. 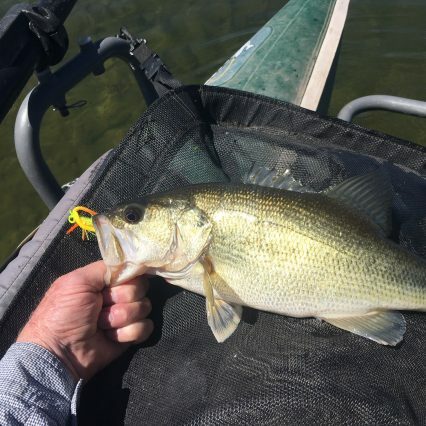 At first I thought it was new structure they had placed as I am not really that good on electronics but I went through one of the balls and actually snagged a 5″ shad. I fished for about 4 hours and never hooked up. Fishing is MADDENING at times. I was fishing 5″ Helmet Heads in shad colors and maybe should have downsized. The wind got me about 11 so I went and ate and then hit the river for the rest of the afternoon. 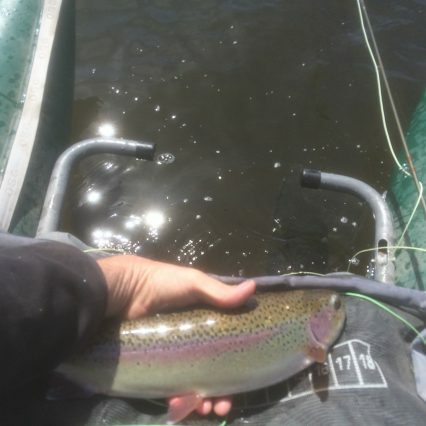 Blanked there too…..in some of the most gorgeous water I’ve fished? At this point I’m ready to pack it in, take the long way home and hit the valley lakes. I called Joe and told him the bad news as he was planning to join me Friday evening. 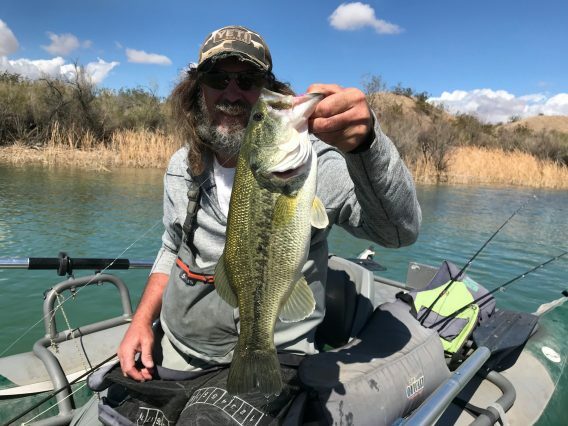 Plan was for him to work til noon anyway so I hit the Bill Williams again Friday morning before I was to leave for the valley…..and the birds were there again and the fish wanted to play. 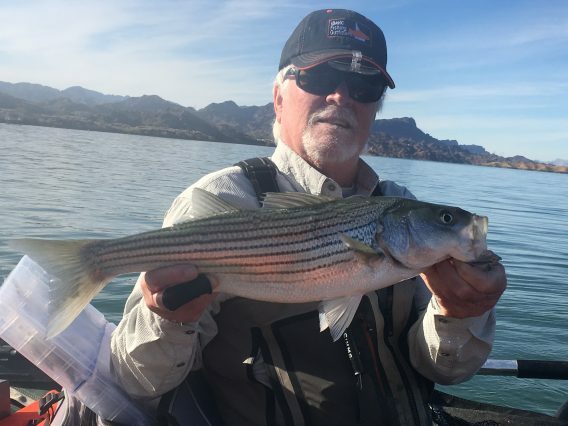 Turns out there are tons of smallish stripers this year at Havasu…the 1 lb variety. This is why I was getting short struck so much earlier. 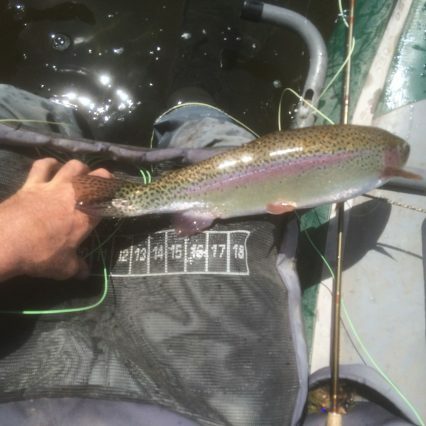 I’m not much for counting fish but I must have landed about 40-50 of them with several 2.5 to 4 lbr’s in the mix. What a difference a day makes. 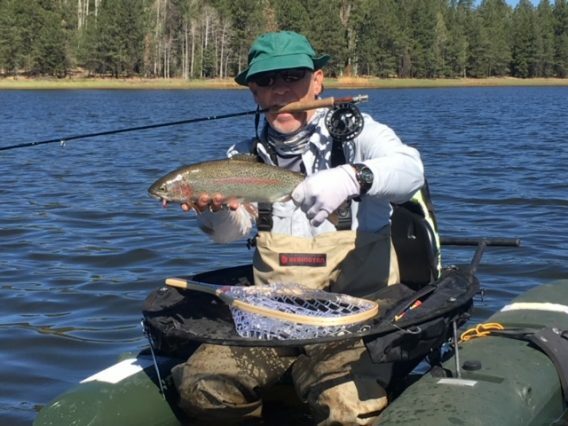 I still had a lot of short strikes but most of these fish were inhaling the fly. I called Joe and told him change of plans….get over here. Saturday am the gulls were there again and so were the fish. We didn’t catch as many as the day before but landed at least 35 between us and some bigger fish came in as well. The big girl (at the top) went 12 lbs. The pic doesn’t do her justice, really as she was incredibly fat. I also had one just take me for everything….three strong runs and bam…she was gone. Next morning we hit it and the birds weren’t around like the previous days. The bite wasn’t as good either. 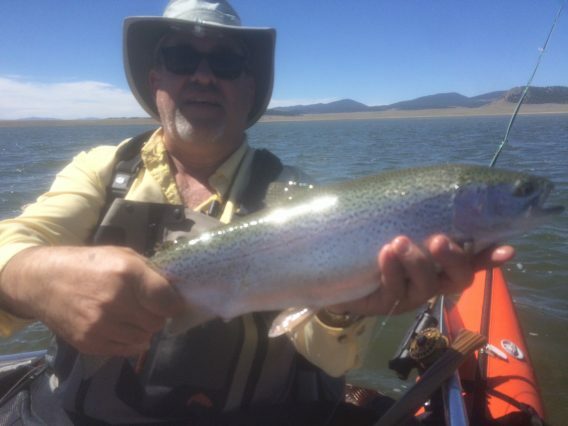 We fished til 11 and had a dozen between us…all the 1 lb variety. I think the shad are going to be there for a long time as this is where they have been the past three seasons now so fishing should stay strong. You just have to be there at the right time when the big ones want to play…..and I plan to be there.